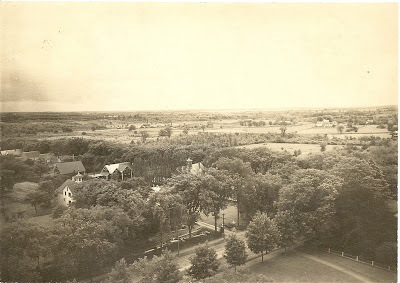 The view above was taken about 1902 from the tower of Middleborough Town Hall looking south, and depicts the existence of a pre-suburban sprawl rural landscape in close proximity to the village. In the bottom right appears the front lawn of what was then Middleborough High School, later the Bates School and now a portion of the Veterans' Memorial Park. Directly across the street is the Horatio Barrows House, now home of the Masons. Although the house is not visible behind the trees, construction work is clearly being carried out and the photograph probably depicts the house during the major renovation which transformed it into a southern-style home. Clearly visible, however, is the white-painted Barrows Barn with its square cupola on top. The row of houses behind is Rock Street. In the far distance in the middle of the picture, the Middleborough Pumping Station on East Grove Street with its brick smokestack, may be seen, with the George H. Shaw varnish works visible as a nearby cluster of buildings. Further to the right are the early houses on East Grove Street. Between Rock Street and East Grove Street are the Harlow and Pickens Farms, now the site of Woodland and Mitchell Streets, and Mayflower Avenue. Barely discernible near the top of the photograph, just below the horizon, is Lake Assawompsett.